Hello everyone. I am in a much better mood than I was when I wrote my last letter. I think it is alright to express anger if you see things going on that you do not like. If we could all stay in a peaceful state all the time we would be superhuman. I am usually a very peaceful person and try to stay that way. This time I will just talk about what the planets are doing. We are approaching a very powerful full moon on October 24 at 9:24 AM PST. At this time there will be a T cross in the heavens with the Sun conjunct Venus opposing the moon conjunct Uranus and squaring Saturn. Uranus always brings surprises and it is hard to predict just what will occur. The exact degree helps figure out what may happen. The sun is on one degree Scorpio. The meaning of this degree is “The fundamental human eagerness to expand one’s social horizon and to experience the results of collective achievements and a new way of life”. Venus is on the degree of “A youth carrying a lighted candle”. This could mean that many young people are waking up and wanting to take part in a group effort. Maybe this is referring to the upcoming election in the United States. The moon is conjunct Uranus on one degree Taurus. This degree means “the pure uncontaminated and spontaneous manifestation of one’s own nature. Out of the past a new pure release of potentiality has emerged. This energy is ready to perform whatever work its dharma is to accomplish”. Saturn is on four degrees Capricorn. This degree means “The ability to use natural resources and basic skills in order to achieve a group purpose”. There seems to be a flow of energy for change written in this upcoming T cross in the heavens. 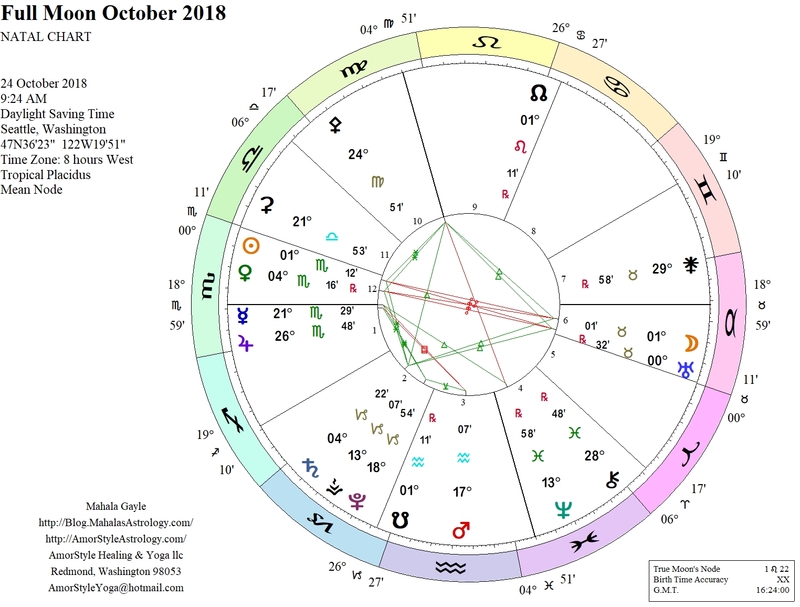 The ascendant for this chart is on 23 degrees Scorpio (West Coast time). This degree means “The raising of animal drives to a higher frequency.” Mercury is on 21 degrees Scorpio. This degree means “The readiness to face the results of a refusal to follow the authoritarian patterns of an aggressive society”. These degrees tell a story of us moving into a new way of life. I guess we will see how this all works out. “These degrees are from the book “An Astrological Mandala”. Jupiter is making its last stand in the sign of Scorpio and has brought to light many misdeeds of the past and many of them have been of a sexual nature. On November 8 at 4:38 AM PDT Jupiter will move into Sagittarius. This sign has an entirely different meaning than Scorpio. Sagittarius is a fire sign and rules freedom. It also rules higher consciousness, judges, supreme courts and other courts of law, colleges, the Vatican and religions. Watch how the energy will start to change as soon as Jupiter moves into Sagittarius. I find it interesting that Jupiter moves into Sagittarius shortly after our election is finished. This full moon energy will be in effect until the election here in the United States. There are other events that will occur before and after this full moon. The first thing is the sun is opposing Uranus which brings changes of all kinds to light. Two days after the full moon the moon will be opposing Jupiter. The two areas that will be affected by Jupiter will be the West Coast USA and the Middle East. 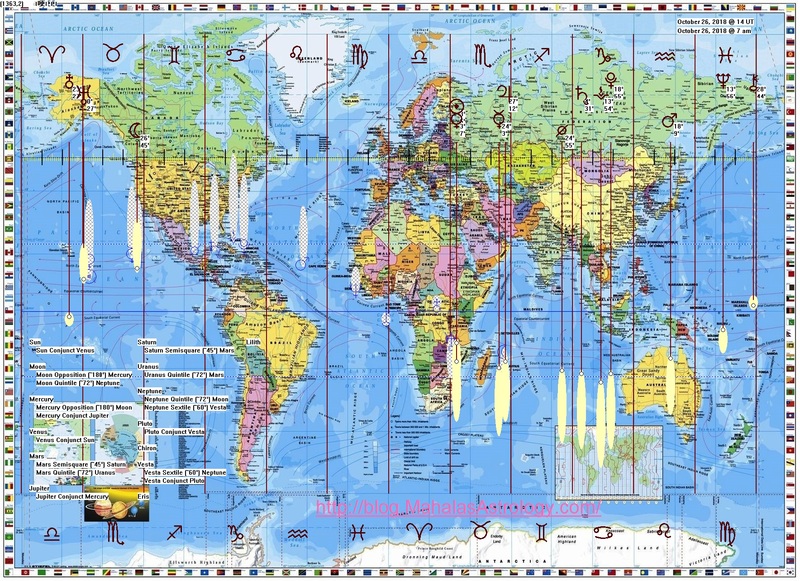 On my world map Taurus rules the west coast and Scorpio rules the Middle East. There is already an event that happened last week with Mohammed Bin Salman, the ruling prince of Saudi Arabia. He was accused of killing an American reporter from Virginia. The latest news is that 19 of his people have been accused of this murder. I think there will be more chaos in the Middle East from this full moon. Mohammed Bin Salman came to power in 2016. When he first came to power he arrested several of his relatives and business men in a hotel and then stole all of their money. Then he started the war in Yemen which has been very devastating. On this full moon day there will be a Future Investment Intuitive Conference in Riyadh. Some leaders have backed out of this meeting in protest of the death of the reporter Jamal Khashoggi. The West Coast will also be involved in this full moon energy. We could have some stormy weather along the coast. There are also 4, 000 emigrants on their way to the southern border of the United States and Trump said he will not let them into our country. This could cause another major challenge when they arrive here. Right now, they are at the southern Mexican border. Link: Mercy and Compassion Meditation. We are in the energy of chaos and have been there since September of 2015. Everyone seems to be in chaos in one way or another. It has been a rough time for light workers, especially the ones who have held the light for so many years. We are getting tired and are ready for a change. Hopefully we can vote our way into a new energy that will put balance into our government. We are in a very critical time period and it is time for us to stand up for what we believe and express this energy in a peaceful way. Our country has become totally polarized. How can you get anything done when there is always fighting between the two parties and this has gone on for a long time. Now it has reached the point of total chaos. United you stand, divided you fall. What do you choose to experience? Uranus, the planet of change is retrograde in Taurus until Nov 7 and then it moves back into Aries until January 7, 2019. In January Uranus moves into Taurus to start a new cycle for seven years. Taurus rules money and the Earth. The North Node moves out of Leo and back into Cancer on November 7, 2018. This is a big deal. Cancer energy is very different from Leo energy. Cancer rules women, home, family and food. The node will be in Cancer for the next year and a half. Hang in there because we will make it one way or another. Please visualize the energy of love and light surrounding the whole world, and please stay in that energy of love and give thanks for all of your blessings. Giving thanks works wonders. All is well in my world. So Be It. I would like to thank all my community members for your unbounded support. I am excited to see the number of reports that everyone is receiving and my son says that there are more to come. If you would like to join the community, my son is still offering the introductory price special. Please see my purchase page for more details. Please see the community page on the website for community specific posts.